Brentford supporter Matthew Benham has paid out nearly £3m to take over some of the League One club's loans. Benham has taken over a £2m bank loan and also paid ex-chairman Ron Noades' company £940,110 for a £1m loan. Benham will hold both interest-free for five years, while Noades has written off a £250,000 payment due this week. 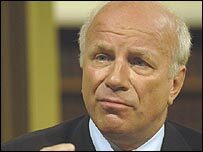 "This is a welcome boost to our efforts to reduce debts and survive until we can build a new stadium," chairman Greg Dyke told the club website. "The club is currently facing an uphill battle to stay in League One and as a business there are some tough challenges to face. Matthew Benham's wonderful gesture will immediately save us over £150,000 per year in interest charges." Supporters' trust Bees United took over the club last January and their chairman Brian Burgess said: "We are extremely grateful to Matthew for his extraordinary generosity. Brentford fans have always shown their determination to help the club. "In the past two months spontaneous fundraising efforts have come up with over £30,000 to help strengthen the squad with loan signings in the January transfer window."